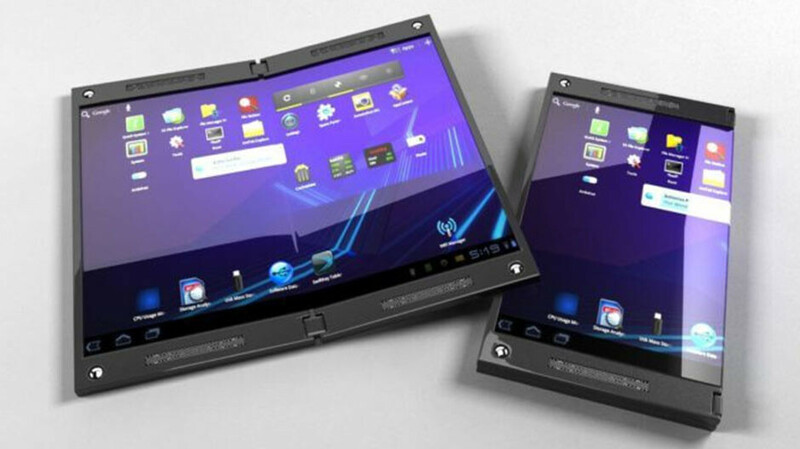 We have been teased with "foldable smartphones" for a while now. For a couple of years, we've been hearing that Samsung is prepping one, but recently, manufacturers like Xiaomi and Huawei also threw their hat in the ring. And while the concept might sound a bit outlandish, we do remember that the Galaxy Note Edge, which launched back in 2014, was quite eccentric for its own time as well. 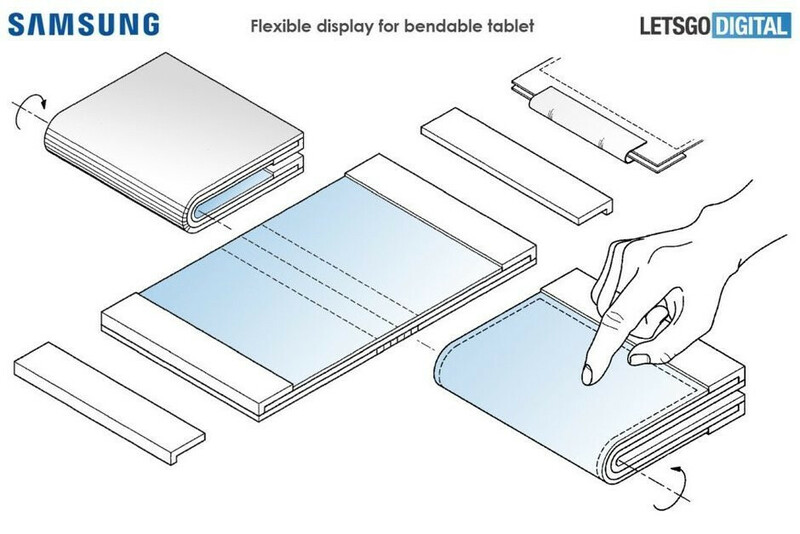 By the looks of it, the future might just be foldable. And that future might be very, very close. Samsung has teased us time and again with its upcoming Galaxy Fold (name unconfirmed) and it seems we just might see it announced on the 20th of February, just before MWC! Huawei will be close on its tail, too, so we presume Sammy is in a hurry here. So, it's a good time to take a look back at the leaks, rumors, and patents that would help us understand how and why that phone would function. Why would a phone fold? Nowadays, we do a lot on our smartphones. We watch YouTube clips, some even go through entire movies, we read a ton of social media posts, answer to emails, edit our favorite photos, some even do work on their handsets. A bigger screen is certainly a good thing to have in those situations, but a smartphone should still be comfortable enough so that one can carry it with them at all times without being bothered by the device too much, right? Samsung has always shown support for this type of poweruser — ever since it launched the first Galaxy Note and prompted the industry to go beyond the 5-inch display size (back in 2011, that was considered a huge phone! ), Sammy has consistently focused its flagship phone efforts to satisfy a poweruser's taste for power and productivity. We believe that the foldable phone would be a natural evolution of that idea — it will be a compact device that can spread out to the size of a mini tablet, comfortable for both work and play. OK, how will this thing be called? A trademark for a Galaxy X popped up back in February of 2017, which was believed to be reserved for the foldable phone. Most people have been calling this project the Galaxy X for the last couple of years. The name Samsung Wing has also been spotted in a patent and it does sound like it suits a device, which folds down the middle, but we haven't heard that one in a while. More recent rumors are suggesting that it would be called the Galaxy Fold. Its display will also have its own name — the Infinity-V display, with the letter V representing the fact that the screen folds right down the middle. What would the design be? Any hardware details? There are a couple of ways a folding phone could work. It could either wrap around itself, closing the display in, or fold outwards, leaving a screen area to cover the front and back of the device. A Samsung patent, spotted back in January of 2017, depicted a phone with a 5-inch display that can unfurl to become a 7-inch tablet. The display folds over the outside of the phone, like it's the cover of a book. This means that, when it's in folded mode, the phone will have screens both on the front and back. At MWC 2018, Samsung Mobile CEO DJ Koh said that the outwards-folding technology is still pretty hard to do and is not ready for market yet. 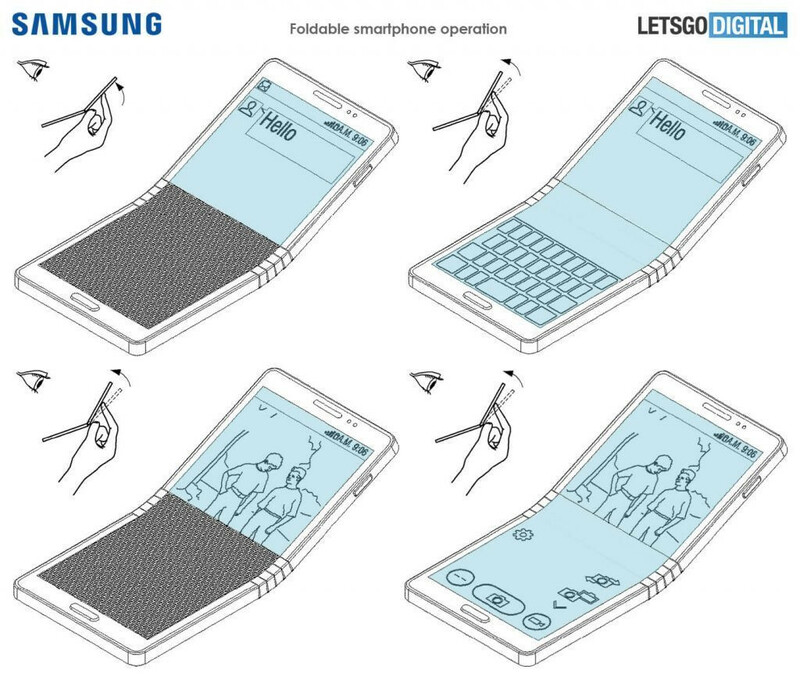 Instead, Samsung might launch a smartphone that folds inwards first. The device was teased at Samsung's Developer Conference. The lights were dimmed and it appeared to be encased in a box, so we couldn't see how the phone would actually look. But Samsung very clearly showed us that it's an in-fold — the phone closes like a book, with a huge display area on the inside, and an extra display on the outside. According to this leak, the outside display would have a 4.6-inch diagonal, while the inside screen would be much larger, at 7.3 inches. A patent, granted to Samsung, which we saw in July of 2018 also showed us the same design. A phone with a horizontal fold straight through the middle, which can close up to become a square-ish device when not used. The hardware inside the device is still a well-kept secret. We would assume that it would have the latest-and-greatest Qualcomm Snapdragon processor and a hefty amount of RAM to go with it, but we have nothing solid to go on right now. However, the battery has been discussed numerous times. The latest info says it will be a 4,400 mAh cell, though an older rumor said 6,200 mAh. So, between "Rather big" and "Wow, that's massive!". We've also caught a whisper that the Galaxy Fold might rock a triple camera module — presumably, the same module that the Galaxy S10 and S10+ will have. So, there will be no tablet-smartphone 2-in-1? Actually, there just may be one! Another patent, which Samsung filed for in April of 2018, depicts a large, tablet-like device, which folds outwards and only uses half of its display if the user needs it to. We dare speculate that Samsung will definitely launch the smartphone first, see if the market likes it, and improve upon it before it starts building such a tablet en masse. However, it's obvious that the company is considering the option. As it should really, since Huawei and Xiaomi both seem to be interested in making an out-folding device, beating Sammy to the punch on this one. 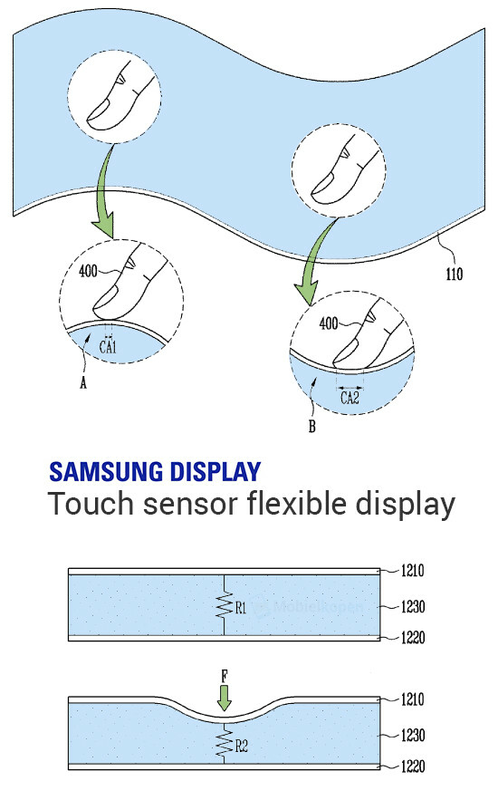 According to a patent that popped up early this year, Samsung might be working on a Force Touch-like technology for the foldable phone. The document describes pressure sensors mounted underneath the flexible screen of an electronic device, so yes — that's why we are thinking that. Let's hope it doesn't turn out to just be a pressure-sensitive home button like in the Galaxy S8. The upcoming foldable phone will reportedly be a "super premium" product with limited availability and probably a premium price. While it does sound that not everyone will be able to get their hands on it at launch, it may slowly hit more and more international markets. That's what happened back in the day with the Note Edge — it was sold only in South Korea and US in the beginning, with Samsung constantly stating that it's a limited edition phone. A few months down the line, it was available in most parts of the world. It's worth noting that Samsung has been toying with the idea a lot. A patent for a foldable phone that's a dedicated gamer machine also popped up — one half of the display works as a regular screen, while the other one is a dedicated controller area. There was also the one that let the phone fold up into a bracelet, so the user can carry it around like a smartwatch. Of course, patents often get filed left and right and don't necessarily end up being actual products, but it's worth noting that Sammy is exploring lots of various possibilities. Release date? Dare we ask — price? According to the latest teases and discussions, Samsung may be prepping to reveal the Galaxy Fold at its February 20 event and showcase it at the MWC superconference immediately after. Some say the company wouldn't throw its phones in the ring to cannibalize each other, announcing the hot Galaxy S10 trio alongside the fresh and futuristic foldable phone, but this wouldn't be a first for Sammy. Back in the day, when it was experimenting with curved screens, Samsung had no problem launching the Galaxy Note 4 and Note Edge, then the Galaxy S6 and S6 edge as duplets. That was before it was cool to have two flagships out at once. As for the price... well, it's not hard to imagine that something like this will cost a lot of money. The more modest rumors say $1,850, however, we very often hear the tag of $2,000 thrown around. Needless to say, this phone will be for the early adopters and tech enthusiasts, at least in the beginning. Which is another reason to believe that launching it together with the Galaxy S10 might not be a negative — different classes of devices rarely step on their siblings' toes. Trying to read Samsung x article but this intrusive scroll ad keeps f***ing up. Let me go to Android Central. Good grief. Or Adguard, Adblock etc. There are years with no ads viewed on mobile or desktop. Sometimes I can see the experience with ads on my friends phones or desktop line. Meh! That's why people should try Samsung browser with adblock option. Wait until they hit you with that pop up which forces you to install malware by claiming a prize. CM browser is great too. I’d rather take my chances with ads.. Wait, didn't apple patent that a while back? Sleeker and better design than this. How would you know? The drawing is an example, not an actually device. We get it, we know you hate true innovation by a company that makes it own stuff vs an OEM who pays 3rd parties and sells at higher price with less features and capabilities. Just in case your ignorant to all of this. For many years now at CES they have been showing off rollable and foldable displays. I saw the first foldable panels at CES 2013. It takes years to get things right. It takes many more to get the manufacturing of these new panels just right, and at a low enough cost to make it feasible. If a Galaxy S9 near $900 won't sell...do you think a Galaxy foldable phone over $1000 will sell? Samsung is trying to find that hit that won't work for its consumer base. Samsung's problem is that they have $100 phones up to $900 phone in their lineup. A majority of what Samsung sells are their $100 phones. That makes up 50-60% of their 300+ million yearly sales volume. If it will work properly, not compromise durability I don't see why people won't buy after all it's much more functional than iPhone X and I'm sure Samsung will create some features that none of other manufacturers don't have yet because of this flexible screen. Functionality is one component of user experience, but app development is what drives user experience. We will see to it..just becoz s9 doesn’t sell well doesn’t mean game over for Samsung. Samsung really has you twisted up inside. Who me? Samsung's mobile business will only sustain so long as they are trying to be all things to everyone. Plus if they wanted to compete with Apple they would have created their own Tizen OS rather than rely on Google for the OS and app development. Oppo, Huawei, Xiaomi are coming for Samsung. Like Apple all good things must come to an end at some point, but we are beginning of a tough times at Samsung Mobile and not their Samsung Semiconductor. Oh just shut up. Samsung doesnt compete against Apple on any level. They are better for lots of reasons. No one can compete with Apple because the playing field is not level. No one has iOS. If Samsung had iOS Apple would sell less than 10M phones per year, just like most Android OEMs sell less than 10am phones per year. Just stop it dude. You are to much of a fan to understand anything about Samsung. You act like Samsung Mobile pays Samsung bill. According to the facts, Samsung Electronics is Samsungs largest company and it has zero to do with their mobile products. You continue to repeat the same stupid crap all the time. Please grow up. This one of the reason why S9 and S9 plus price drops so fast. when its new technology, yes it will sell, and is someone forcing you to buy there phones? Awwwww, show us on the doll where Samsung touched you. The S9 did sale, maybe not huge sales numbers but it sales. So dont say they dont sale. First off, it is obvious this device isn't for everyone. Do you know anything about marketing? Do you have a job or old enough to have one? It obviously a unique group of targeted people. There are plenty of business men and women who would like a device like this. You think every produxtbif for simpleminded sheep like you and other Apple, Samsung hating groups. Just because you are to dump and not open minded to see the benefit if this device, is your own fault. I think the annoucement on Feb 20 is just to tell the world that Samsung are kicking off to a new era of using smartphones, and to show consumers that they finally did it. Hopefully mid-range cheaper foldable phones by Samsung or other manufacturers will be developed in time to come. My heart and soul are with you Samsung. Thanks for bringing us the most innovative products ever although most haters see it otherwise. The world will remember this fantastic company in history. God bless Samsung and our hardworking people around the world. Hail Samsung our dear savior! The catalyst for great future. Folding screens may turn out to be a great thing. Right now I am looking for a phone that is really good at being a phone. I work in what used to be a mainframe computer room so no windows near me and thick concrete walls. My Note 8 rarely gets above 2 bars of signal and has dropped more phone calls than any other phone I have had. It is OK for a 1 or 2 minute call but if I get put on hold it will drop. I miss my real BlackBerrys that rarely ever dropped a call.